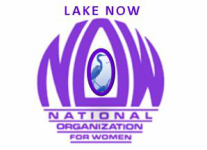 ﻿﻿Lake NOW is a chapter of the non-partisan Florida and National Organization for Women (NOW) devoted to the continuing improvement of women’s rights and freedom from discrimination. Consistent with the foregoing, Lake NOW will embrace members of all races, ages and sexual orientation. NOW will focus on activities that advocate and advance the equal status of women and girls in all aspects of their lives through educational, legislative and political work, while adhering to the bylaws, policies and resolutions of the Florida and National Organizations for Women. New members may join Lake NOW by completing the Lake NOW membership form (below) and mailing it with a check as directed on the membership form or you can join here and choose Lake FL0280 - listed under Central Florida - as your chapter affiliation. You may also come to a chapter event and join us there. Current NOW members may transfer their membership to Lake NOW by visiting the National NOW web site at http://now.org and selecting Members and then Add / Change Your Chapter Affiliation. Current NOW members may renew their membership with the Lake NOW membership form or at the national NOW web site under Members. Thanks to Indigo Design and Chris Meyers for logo and design.